Hardwood floors installation charges and associated with installation fees for projects over 600 square feet of hardwood flooring installed. By default, hardwood floors installation cost calculator estimates labor fees to install prefinished solid wood flooring strips or planks in two average size bedrooms, one living room and a hallway. Basic nailing down of hardwood flooring to already prepared and leveled wood subfloor was taken into account while estimating labor expenses. Homeowners can easily set own parameters and estimate cost of labor to get hardwood floors installed based on particular room size and work scope to complete. 1 All hardwood floors installation areas measurements should be entered as real numbers which are bigger than 0 (zero) for specific value or equal to zero for no value parameters. Inches values should be entered as real number means 3 inches = 0.25 feet; 6” = 0.5’; 9” = 0.75’ and so on. 2 Project details specify all tasks which should be completed during hardwood flooring installation. 3 Hardwoood flooring calculator computes total installation area and average completion time based on project size. 4 Labor cost to install hardwood flooring divided into three separate categories. Minimum cost is a typical labor charge for very basic low budget hardwood flooring installation acceptable for rentals or low value residential properties. Average cost is a most common charge for majority of hardwood flooring installation projects. 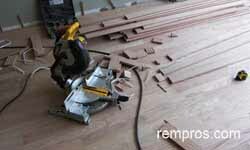 Maximum cost is a labor fee for custom complex hardwood flooring installation projects. Hardwood flooring installation cost calculator is for a general purpose only. Every home improvement project is unique, and labor fees might vary depending on work complexity. Only local hardwood flooring installer is able to price the work with 100% accuracy after analyzing its difficulty. How much did you pay for hardwood floors installation?